should be worn centered on the RIGHT Pocket of the Scouts BSA Uniform Shirt. Read and understand woods tools use and safety rules from the Boy Scout Handbook Scouts BSA handbooks. The Scout's "Totin' Rights" can be taken from him if he fails in his away if they fail in their responsibility. 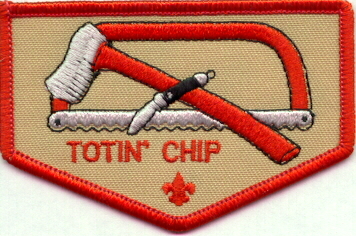 These older versions of the Totin' Chip card (No. 4234, 34234 and 34234A), shown below, are still valid.